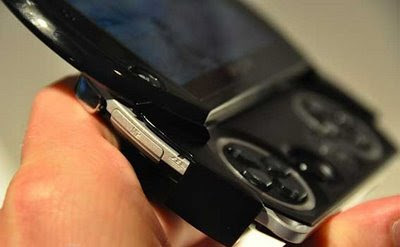 Handheld Addict: PSP Go USB port? Ok.... I think I've gleaned a LITTLE bit more about the PSP Go... like where the USB port is. Check out this hands-on posted at Endgadget. I assumed that this was the memory stick micro slot, that it was spring-loaded with no door. But clearly, there is a memory stick micro, M2-- door along the side of the unit similar to previous PSP models. On the possible upside, iPods use their proprietary ports for things like video out, so maybe the PSP Go will use its port in a similar way. If that even is a USB port..... And is that the only way to charge the battery, like with iPods & other mp3 players? I can't see an AC adapter port. More pics of the PSP Go can be found at the Amazon listing. I was worried about the same thing . . . Do you think we can convince them to completely change that back to a mini-USB port? Apple showed that people will accept proprietary. And honestly, it is very rare to find ANY mp3 player that accepts a regular or mini standard USB cable these days. 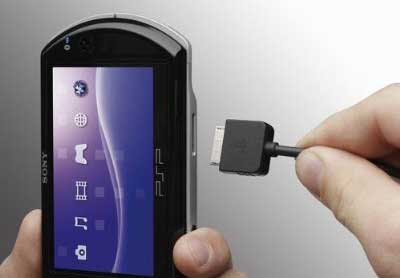 When I was researching which mp3 player to buy back in 2006, I was frankly surprised to find out the PSP used a regular USB cable... it was one of the things I put in its favour when comparing it to other players. But by making it a proprietary port they can do more with it, as shown by using it for video out (and rumoured to somehow have video IN capabilities too?) So who knows if it might turn out to be a blessing. At this point, with what little I know right now, I don't see any advantage to the consumer. Another way that Sony can get money from the consumer. Come on Sony, get your act together!